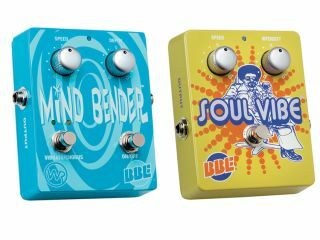 Alter your senses and get your soul groovin' with these two wicked pedals from BBE. Why, just the other day we were telling you about BBE's new Two Timer pedal, and now here's two more pedals to change your whole life, or at least your guitar sound - the Mind Bender and the Soul Vibe. The Mind Bender is a dual-mode analog Vibrato/Chorus pedal that uses the BBD (Bucket Brigade Delay) circuit and was patterned after two rare vintage guitar effects pedals: the Boss VB-2 Vibrato™ (Pitch Vibrato) and Way Huge Electronics' Blue Hippo™ (Analog Chorus). The Mind Bender produces a wide range of lush vibrato/chorus and rotating speaker effects. Features include speed and depth controls, vibrato/chorus mode switch, true hardwire bypass, a blue LED to indicate on/off status and pulse rate of speed control, a nine-volt AC adaptor (U.S. only), and a five-year warranty. It sounds freakin' amazaing, too. U.S. list price: $209.00. Check out these spaced-out video demos of the Mind Bender: Demo 1, Demo 2, and Demo 3. The Soul Vibe is a rotary speaker emulation pedal with that perfectly seasoned "phase-like" quality. It delivers the ultimate in consistency and reliability, so stop searching for that perfect three-decade-old original, because the goods are all right here. Features includespeed and depth controls, true hardwire bypass, a blue LED to indicates on/off status and pulse rate of speed control, a nine-volt AC adaptor (U.S. only), and that all-important five-year warranty. It won't make you play like Hendrix or David Gilmour, but you can sound like them. That's a whole lotta soul for just $189.00 U.S.
And be sure to check out these chillin' video demos of the Soiul Vibe: Demo 1, Demo 2, and Demo 3.